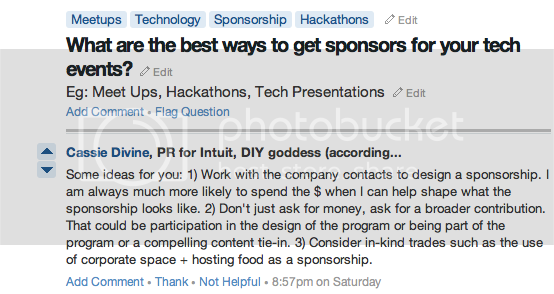 What are the best ways to get sponsors for your tech events? One person in a good position to know would be the Director, Corporate Communications for software company, Intuit. Cassie Divine took the time to provide a thoughtful response to the question on the fast-growing Q&A community, Quora. Obviously, these tips don't guarantee you a sponsorship from Intuit (or anyone else for that matter), but they may provide good insight into how sponsorship decisions get made. See below.